Simple – Download, Edit, Send! So that was the challenge. Crank up the marketing machine to attract more customers. I thought he was off to a terrific start. He already had a nifty website with positive testimonials and he had developed relationships with a few local Realtors in his area. Brian wanted brochures, biz cards, car signs, neighborhood door hangers, and a high ranking on Google. Additionally he really wanted to expand the company’s Social Media presence. Go big or go home – right? Marketing for any small business often comes down to a balance between what you really want and what is in the Marketing budget. As both a contractor and a painter I thought many options were available for him. Design a postcard for a mailing sent to select neighborhoods introducing his services. Also, for comparison I would do a door hangers campaign in a different neighborhood. Then see which marketing technique brings in better results. Yes, I am aware that money does not grow on trees and any mailing costs can quickly add up. My suggestion? Start small and be laser focused with who your target customers are. With printing up Marketing door hangers, again … start small. For example, as a house painter leave a door hanger on several next door houses to your current project. The neighbors will certainly notice the difference and see how nice a home can really look with a professional polished paint job. Who would say no to that? Include a link to your website, or Facebook page, or Instagram page (but not all three). Now of course there is a little more to your message than that on the door hanger, but you get the idea. It stirs up interest. Specifically for painting but this also applies to Brian’s contractor services as well. Don’t just (basically) say — Hey I paint, when your house needs it, call me. Big wow. Who cares. That’s what the ‘other guys’ do. Let me ask you a question. What percentage of homeowners will need painting at that very moment? A very small number. So what happens. Most people will toss it in the trash if they receive a mailing such as that. Nope, no painting needed at this time where is my trash can? I wouldn’t say it is money wasted but maybe a different approach would bring in better results from your marketing dollars. Try this approach. You can do this with either postcards or a door hanger. If you educate your customers in some way then you have a better chance of hitting your mark. They just might say wow, I didn’t know this — smart, let me keep this (postcard) for future reference. For example, you could list the top five ways that paint helps protect your house, or … three ways that worn out paint is hurting your home’s value, or … a painting project is less expensive than you think and here is the payoff compared to repairs needed 3 years down the road. Those are just suggestions off the top of my head; you’re the expert so I am sure you can think of better tips for homeowners. Make sure your message is worthwhile so folks will KEEP your Marketing piece! When you think about it that’s why many times there is a calendar on a postcard so your business will hopefully stay in view of the customer as it hangs on the fridge door. Here is another great idea. Magnetic Marketing car signs for your vehicle. Sure it’s mobile Marketing, but what you can also do is park your car at a high traffic area such as a Home Depot parking lot. You can easily outsource that to a friend or hire someone to do that. Then get ready because you WILL get calls! As a former RE investor myself I would park my car at Home Depot with my vehicle signs every Saturday and Sunday and I can tell you that it works. Also, give folks an incentive to use your service. Stand out from the crowd. A time sensitive discount offer could work well. Next up is Marketing to local Real Estate agents. This suggestion is really a no brainer. Expand your circle of influence by contacting Realtors in your local area. These guys (and gals) really know the marketplace and they have a ton of contacts in the real estate industry. Within the email link everything back to your website or Facebook page. This is where all of your services are listed, and the benefits of working with you are listed, and a call to action of course. You want to keep a central theme and a predictable flow for how folks contact you rather than be all across the board. Also, to make sure you get a response you should ask a specific question or two of the Realtor. In other words, engage and encourage a dialogue. For the ‘high roller’ Realtors that you really want to build a relationship with I would also send a formal letter along with your business card. A few other ideas for Marketing to Real Estate agents. Go to open houses, introduce yourself, leave a business card. Go to foreclosures, and do the same thing … introduce yourself, shake hands, and network. Be actively involved in your local real estate market and good things happen. Mr. Brian also wanted the first page of Google. Sure a high Google ranking is great for business, but often takes a few months minimally to see results. Work your business, get the word out, service the hell out of people and before you know it … that first page on Google will happen organically. As an example, as a part time dispatcher who sent limos to airports I often said to my drivers, “… your goal is to have any client that rides with you say, ‘wow that was the best ride service I have ever taken’ why would I take any other service?” Now that’s service. Guess what happens … they tell all their friends about it too. Same concept applies here — service your clientele, service your working relationships, service your vendors … before you know it the phone rings off the hook. Next up is Marketing for a very specific niche within real estate. For Mr. Brian I also suggested what could be a potential goldmine for a contractor. Focus your efforts on attracting real estate investors to work with. Specifically seek out and join a Real Estate Investors Association (REIA) in your area. Just Google it and you might be surprised how many resources are in your area that cater to investors. It might cost around $125 for a yearly membership but the return on that small investment (yes an investment because that’s really how you should look at it) is huge. Compare those dollars spent to a mailing campaign where maybe only 10-20% (that’s high) will even read and save, and then CALL you. Well then … it’s really a no brainer. As a member, you have access to monthly industry networking gatherings. You will also meet many investors who are trying to build their team and you could even sponsor an event, or maybe even advertise in the REIA monthly newsletter. Simple. If you are a fisherman you go where the fish are … and that’s your local REIA. Work the meeting room. Tell folks you are seeking a few investors to work with. 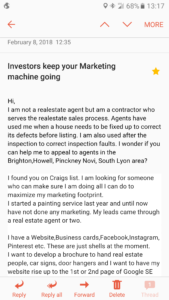 Hand out biz cards, shake hands and say something like, “… if you ever need a walk through inspection (prior to buying) call me I’d be happy to show you what to look for and point out any potential red flags.” Heck any of the newer investors would be crazy not to contact you. You will also notice a ton of Realtors at the networking events. 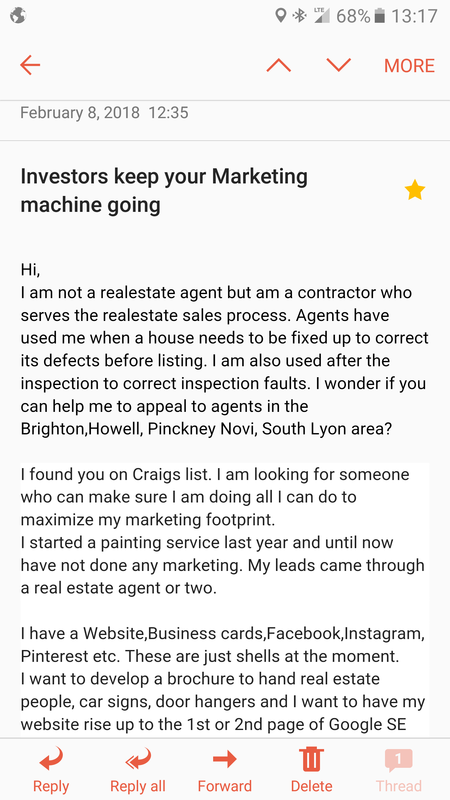 Do the same thing, let people know you are looking for a few Realtors to work with. Some agents understand the ‘investing side’ of the business and others don’t. That’s fine. Tell them you take appointments to make best use of your time and then you come across as super professional and in demand. On second thought why don’t you double your business card order! Getting back to my thoughts on Marketing brochures. As they can be quite expensive, I suggested Mr. Brian initially hold off on these. I offered a different perspective. Rather than spending money out of pocket upfront for these why not let the profits from the business fund the cost. In other words, the first job that results from your postcard marketing campaign will pay for the brochures. Your contractor or painting jobs … funds more work, more jobs. You put the profits back into the business and it grows. Then the business generates the dollars that you need for Marketing. Remember, he was really just starting his business and I know that every dollar counts. A slight adjustment to your mindset perhaps. Rather than upfront big money (marketing costs) and then hoping for positive results (otherwise known as the ‘spray and pray’ method) let the business itself pay for it. What have I done in the past with postcard mailings? Well, I don’t pay for them. Nope. I contact local businesses and ask if they would like to place a small ad (1/4 size of postcard on the back) for a postcard mailing to such and such neighborhood. I just need two of them to say yes. As a result they, essentially, cover the printing costs of the cards and almost all of the postage costs. Mr. Brian already had a social media presence so I just recommended a few adjustments. Quality over quantity. In other words focus on just a few outlets and provide great content. Of course he had Facebook page because … well, everyone is on Facebook. For his line of work I didn’t think he really needed to send out any tweets and I prefer Instagram over Pinterest. Instagram is the fastest growing social media outlet right now and it’s the ideal place to feature all your finished projects. Go ahead and show off your work and be sure to include a link back to your website. Instagram allows you to connect and engage with your audience and for a contractor it’s a perfect canvas to display your remodeled homes. I would stick to those. No twitter. No Pinterest. But that’s just me. Social media can drain a lot of your time and as a business owner you have to make the best use of your time. Money generating activities should always be your primary focus. Then all your content links back to your website where you have your contact information, credible testimonials, an incentive for customers, and of course a call to action. Make your site a place where folks can come for tips and advice. Encourage comments and feedback. Here’s an idea. You could even have 3 specific pages … Homeowner, Realtor, or Investor. Cater each page to highlight the benefits to each of working with you. Maybe add a FAQs page. Let people ask questions. Be the expert. The local go to guy and build your brand. Plan your work. Work your plan. When it comes to your Marketing efforts persistence, professionalism, and patience always pays off. I include these Marketing Suggestions here so any small business can benefit from these ideas even though they are geared towards the real estate business. Disclosure: Original post appears on CompanySheep.com. Also, Mr. Brian did not hire my brain. I think mostly because I was not local and we would be collaborating remotely. That’s fine. I understand some folks prefer a face to face chat and a cup of coffee.